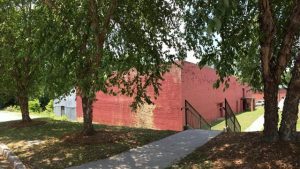 A group of concerned citizens have recently become aware of the fact that a beautifully built, two-story warehouse, with 16-inch thick brick walls and 20,000 square feet of usable space, located within the confines of the Edgefield Historic District, is about to be torn down and lost forever (to create a parking lot). The building is structurally sound, but is in need of repair, mainly to the roof. In only a few years, we could be celebrating the centennial anniversary of the largest cotton warehouse in our town. Built in 1919, the warehouse, right at the end of the rail trail, was constructed by Mr. W. W. Adams to help farmers store the mountains of cotton that poured into Edgefield from the surrounding countryside. Senator J. Strom Thurmond would have been just seventeen years old when he saw endless trains of wagons bringing their cotton in to be stored in this building that had the largest square footage of storage in town. Once there, the cotton was stored until it was loaded onto trains headed for Augusta and beyond. Keeping this in mind, over the years we have heard many splendid ideas come from our citizens on how we might make our community a little bit better. Some people desire an open air market, like the one in Charleston, where the Saturday participants of the Farmer’s Market and other vendors can set up out of the weather. Others long for an exhibition hall where events like “juried arts competitions” and an “Arts on Fire” festival might be held. Then, there are individuals who have strongly suggested that this town needs a proper “folk art” museum, highlighting the talented local two-dimensional (2D) and three-dimensional (3D) artists who reside in our county. It seems a sad affair to lose a building block of history when we might use it to build the future. The roof could be replaced on the warehouse and it could be used like the open air market in Charleston. Edgefield currently possesses the talent and the products to have a very successful market, however, the only place for participating individuals to currently meet is on the Town Square on Saturdays, which disrupts traffic, is somewhat hazardous, and provides no protection from the elements. Furthermore, the second floor could be restored to showcase the relics and highlight the new arts of our community in a “folk art” museum/gallery. This facility could feature a broad spectrum of 2D art and various contemporary crafts. It could also represent every 3D art medium, including clay, metal, glass, wood, fiber and mixed media. There is nothing in this section of South Carolina that can even remotely compare to this ideal. Edgefield is the home of Old Edgefield Pottery, one of the three indigenous art forms in the state. Moreover, there are numerous talented 2D and 3D artists in Edgefield County and the surrounding area today. This includes not only adults, but also youth from middle school through college. Having a place for these individuals to have gallery expositions and sell their art would boost Edgefield’s economy, promote its cultural element, and elevate its social network overall. Therefore, it is believed that the Adams Warehouse should be saved for its historical value. Furthermore, it should not only be saved from destruction, but also be put to good use. The sister to this warehouse, built only twelve years earlier, in 1907, was completely and beautifully restored and is now the home of Piedmont Technical College. By restoring this building and putting it to good use, it will become loved and when it is loved, people will make the effort to take care of it and that is all history really needs to keep going—for someone to take care of and preserve what is already there. Please help by signing an on-line petition, http://www.change.org/p/piedmont-technical-college-foundation-board-of-directors-save-the-adams-warehouse. For more information, please contact Tonya Guy at 803-637-4010 or e-mail at OEDGS85@gmail.com.